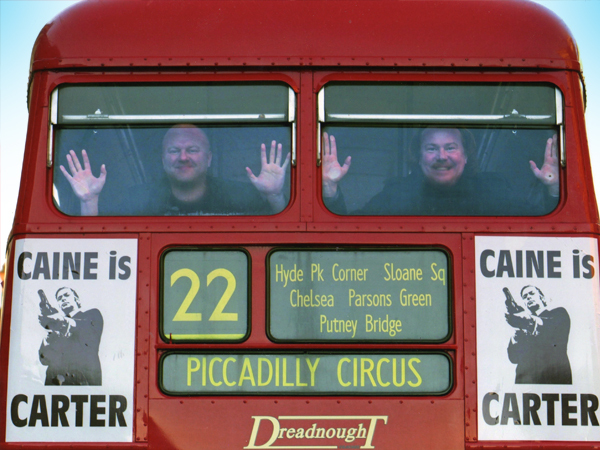 For the 40th anniversary of Get Carter, Tyne Idols in association with the Tyneside Cinema fired up the old Routemaster bus to show off ‘the essence’ of the grittiest British gangster movie of all. NewcastleGateshead is filled with iconic settings in which the classic Get Carter was filmed. On Sunday, 13 March 2011, three screenings of the movie were shown at the Tyneside Cinema, each followed by a Tyne Idols Tour around some of the key film locations with host Chris Phipps, who wore his purple underwear especially. A few surprises along the way were promised and so we were joined for one of the tours by not only legendary director Mike Hodges, but also cast members including screen and stage legend Alun Armstrong, who made sure this time round he had bought himself a course in karate to prepare himself for the day. Amazing recollections and memories as we revisited a load of still-recognisable locations used in the movie such as the 'Las Vegas' guesthouse, High Level Bridge, the West End Crematorium and Dunston Staithes. In fact the day was so intensely busy that the Tyne Idols team had little opportunity to take any photos to record this astonishing occasion—does anyone who came along on the day have any we could use? Photos by Tyne Idols Team as well as by kind permission of various guests. Thanks to Anthony Forster for the crematorium image.